One might assume there’d be waterfalls in a country noted for mountains and rainforest, but I never imagined how spectacular and numerous they would be. Costa Rica is loaded with waterfalls. When I think of waterfalls, I remember the freezing waters of the Kancamagus River in New Hampshire, close to where I grew up. The difference in Costa Rica is that most are nice and warm and many are open for swimming. 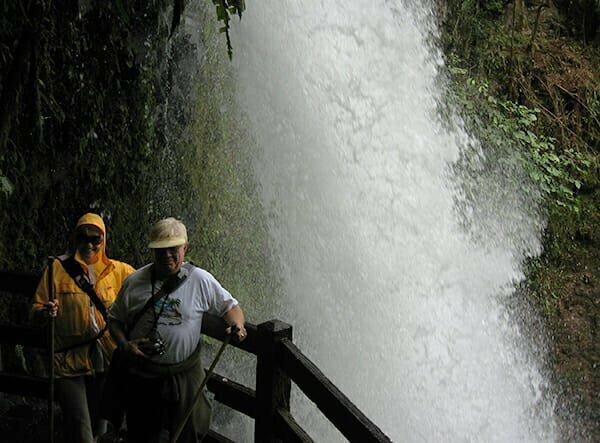 Do be aware: ‘sometimes swimming in waterfalls can be dangerous, but I’ve always liked to live a bit on the edge and adventure tourism is one of Costa Rica’s main attractions. 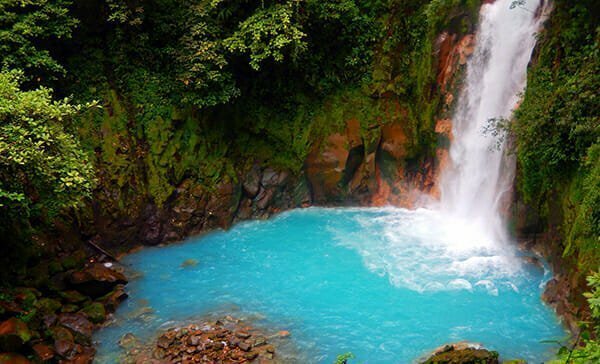 A few really unique waterfalls include one on the Rio Celeste, where minerals interacting between the volcanic spring-fed river and the natural minerals of a rainforest stream cause the conjoined river to glow a bright iridescent blue. It’s breathtaking. Though a hike to get there, this is one of my favorite day trips in Costa Rica. You can also find waterfalls that flank Arenal Volcano, originating from volcanic hot springs. One of my favorites is La Fortuna waterfall on the Tenorio river. This waterfall plunges nearly 197 feet into a perfect swimming hole. Along the flanks of Arenal Volcano, a number of spas have been built to take advantage of these naturally heated rivers. One of our favorites is Tabacon Hot Springs Resort. 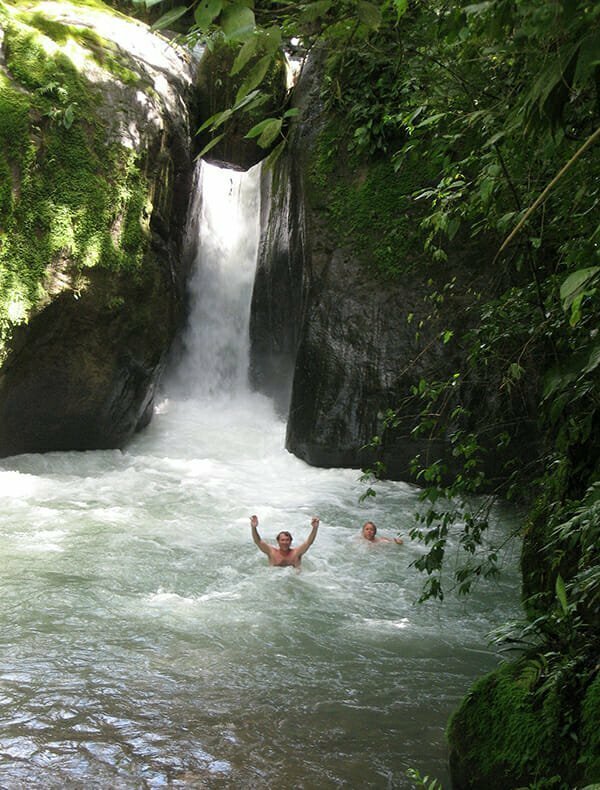 Further south in the town of Dominical, another favorite is the Baru River Falls where you can jump from the upper falls into deep pools formed by millions of years of water eroding the stone. In another area in Tres Rios Coronado, about 25 miles further south, parents often drop their children a few miles upriver and park further down and wait for them to slip and slide their way down. A popular hotel in the area is the Rio Tico Safari Lodge, built along the river and waterfalls. The hotel consists of luxury tents built on platforms that flank the river. The Paz Azul waterfalls are unique in that a huge boulder rolled down the river only to end up stuck between both sides of the top of the waterfall. One of the best viewable waterfall collections is an attraction known as La Paz Waterfall Gardens. This national treasure, a private reserve that’s open to the public, has a series of trails, bridges, and stairways to allow one to get up close and personal with some of my favorites. I joke that a trip to La Paz is like two hours on a stairmaster, but most of the stairs go downhill to a bus at the bottom that returns you to the top. The park is located on the back side of Poas Volcano where the owners have built a variety of other attractions to complement the amazing location tucked in a cloud forest. There’s a huge aviary, a butterfly garden, an orchid and bromeliad display, a frog exhibit, a serpentarium, a big cat exhibit, a hummingbird garden, a trout pool, a traditional Costa Rican farm house, and about six large waterfalls, complete with viewing stations. You can even get next to or behind a few of the larger ones, making for great photo ops. Having led tours in Costa Rica for over 10 years, our clients rave again and again that this is the best attraction in Costa Rica. One point to note, if swimming in waterfalls in Costa Rica, do be aware that rocks, debris, and large branches are often tossed or are floating down the river upstream and may come over the top of a waterfall at any time, so avoid getting directly under the waterfall, as this debris can do serious damage to you. Also be aware of the currents during rainy season; I have witnessed people being swept away by the unexpected force of water. Previously published in the 2016 Spring Issue. Custom, Semi-Custom, or Production Homes? Which is right for you? Despite a temperamental U.S. economy, America’s residential construction professionals are busily building once again in 2016. Case in point is U.S. Department of Housing and Urban Development data released February 17th that shows privately-owned housing starts in January were at a seasonally-adjusted annualized rate of 1.099 million—a 1.8 percent gain from the previous year—and building permits jumped 13.5 percent from the previous year to 1.202 million. Meanwhile, predictions from leading economists at NAHB (National Association of Home Builders), Fannie Mae, and the National Association of Realtors all point to 2016 being the seventh consecutive year of housing construction gains since the housing market crashed in 2009 with less than 600,000 housing starts. As for new home sales, NAHB is projecting a 20 percent-plus increase in transactions from 508,000 to 641,000. To be sure, the peak spring homebuyer’s season welcomes a plethora of new plans, fresh locations, and innovative choices. For the consumer, the options are endless—featuring everything from starter and move-up homes to age-restricted active-adult communities and ranch houses to modest two-story residences and multi-million-dollar Mediterranean-inspired mansions. Whatever the construction case might be in your corner of the country, a few things are certain when it comes to home building in the coming year. Based on feedback from leading builders, future homes will continue to get increasingly smarter, more energy efficient, more colorful, and healthier. Following is a look at the various construction trends, techniques, quality of products, and appointments many of the biggest builders are featuring from coast to coast. When it comes to investing in your ‘dream home,’ the multitude of choices and types of homes can be mind-boggling. Do you buy into a development principally comprised of production homes—arguably maximizing your value? Should you select a choice homesite and build the custom home you’ve always desired from scratch? Or, is the win-win situation buying into a semi-custom residence? 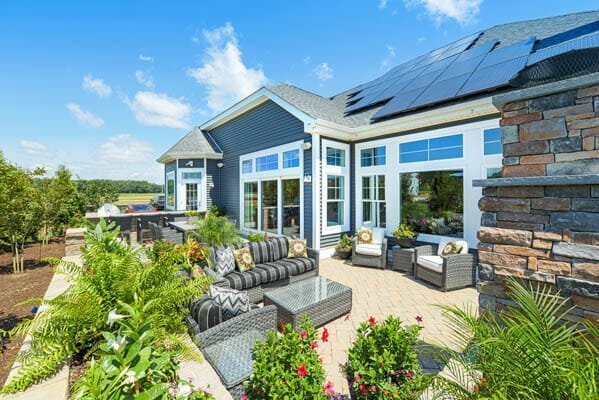 More homebuilders are trying to address that latter compromise by offering a wave of semi-custom, flexible floor plans and features. For instance, at the new Trilogy Orlando and Trilogy at Ocala Preserve master-planned communities in Central Florida, Shea Homes is rolling out the all-new Shea3D “YourPlans” Collection. The patent-pending, open-space design plans come in three interchangeable configurations as if you were picking from an à la carte menu. More than blueprints, Shea’s Your Plans concept allows buyers to “build” homes that will complement and enhance the way they live their lives—whether it’s hosting a block-party wine tasting or having children or grandchildren over for a holiday dinner. Trilogy at Ocala Preserve, which had a grand opening in February 2016 for its innovative new six-hole championship golf course designed by PGA Tour star golfer Tom Lehman and architect Tripp Davis, features five model home designs in the 623-acre development of rolling hills just minutes from the heart of Ocala, FL. Homes at Shea’s two Trilogy 55-plus resort-style communities start in the high $180,000s. 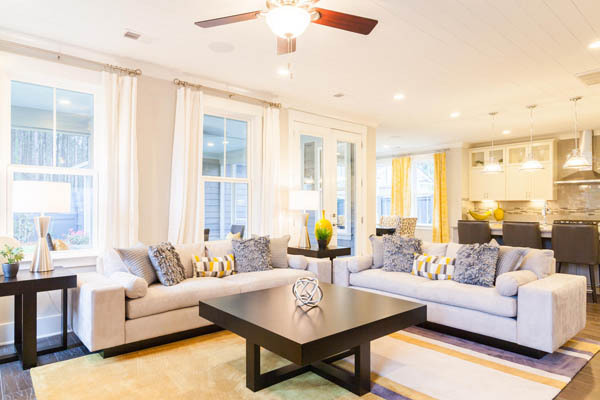 At Sawgrass North in popular Rehoboth Beach, DE, Schell Brothers area sales manager Gary Desch caters to an active-adult buyer looking for either a second home as an investment or a soon-to-be retired residence. 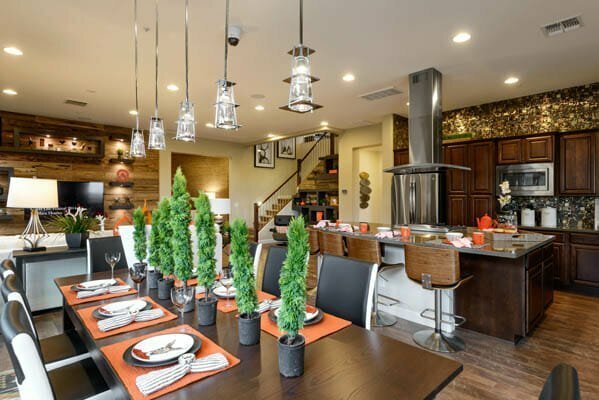 According to Desch, many of his homebuyers are interested in single-level living, with the owner’s suite on the first floor and lots of open space—large open kitchens and great rooms, storage, and outdoor living. Schell says homebuyers are also very interested in energy efficiency, which is why Schell Brothers builds homes using “Schellter Advanced Building Science Technology.” Desch notes Schellter technology, developed in collaboration with one of the top building science firms in the country, yields an extremely energy-efficient home that eliminates the health risks associated with homes and provides unparalleled durability, longevity, strength, and quality. to ultimately increase the volume of things such as insulation and high-performance vinyl windows. 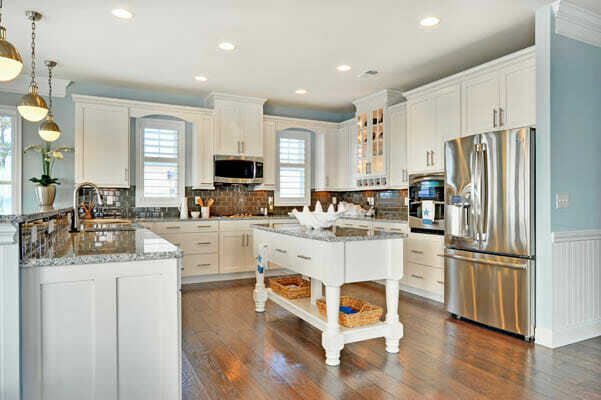 Desch also points out his buyers value the ability to semi-customize their next homes. 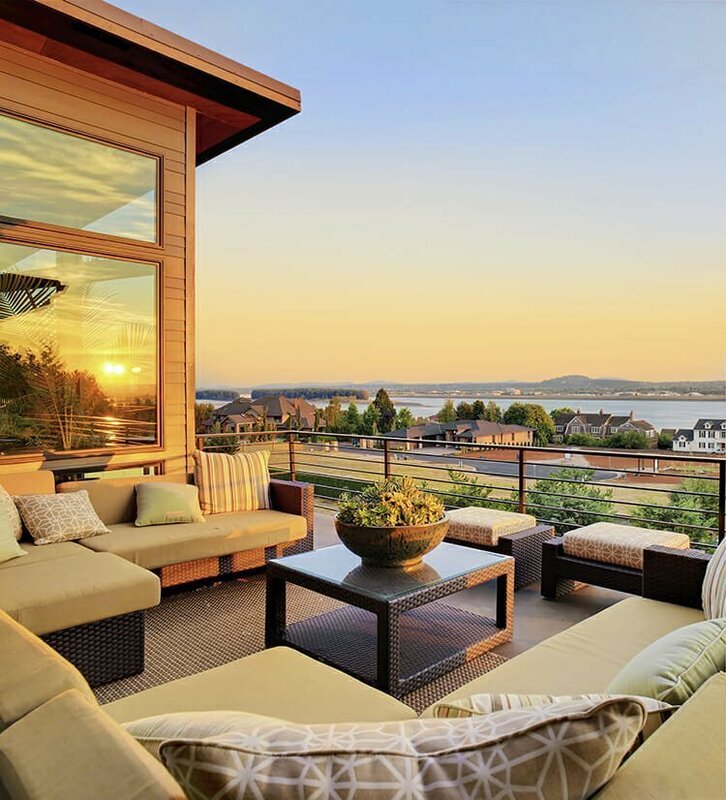 Some of the more commonly requested elements are attractive outdoor living components, including multi-level courtyards with water features, fireplaces, and fire pits, and entertainment options like wet bars and home theaters. Prices for Schell Brothers single-family homes range from the high $200,000s to the low $600,000s. Basically, what the company did was reengineer the traditional laundry room, because research shows the Baby Boomer/Empty Nester consumer wants two work spaces. Logan Homes has been building luxury homes along southeastern North Carolina and the northern coast of South Carolina for 30 years. One of their more compelling new communities is Compass Pointe in Leland, NC, ideally situated about 10 minutes from downtown Wilmington and less than 30 minutes from beautiful Wrightsville Beach. According to PJ Kelly, vice president of Logan Homes/Logan Real Estate, his homebuyers are mostly Baby Boomers seeking easy living open floor plans. Though Minto Communities might be considered a production builder, you’d never know it by their many extraordinary resort-style developments throughout Florida. 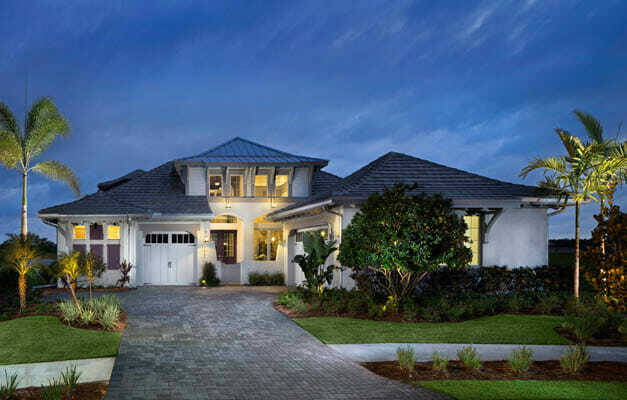 From Daytona Beach to Orlando, and Tampa Bay to as far south as Naples, Minto Communities’ consumers and, consequently Minto’s homes, pay close attention to the design and livability of the home. Depending on the market area and type of home, Minto house pricing ranges from $198,000 to $250,000 at LakePark in Port St. Lucie on the east coast of Florida, or $198,000 to 300,000 in Sun City Center located between Tampa and Sarasota on Florida’s west coast. For the company’s elegant new coastal architectural homes at Isles of Collier Preserve in Naples, pricing starts at $370,000 and goes up to more than $800,000 for popular floor plans that range in size from 2,390 to 2,933 square feet. Lennar Corporation is building a broad spectrum of housing products in Virginia, starting with condos and townhomes in the low to mid-$200,000s to age-restricted Colonial Heritage in Williamsburg, where homes range in price from the upper $200s to the mid-$500s to luxurious million-dollar-plus country estate homes in the Conservancy at Martin’s Chase outside of Washington D.C. Naturally, Lennar’s Northern Virginia market applies more to working families due to its proximity to the nation’s capital, while Colonial Heritage caters to that active retiree seeking an opportunity to live the resort lifestyle within the gates of a community minutes from a destination location noted for its history and endless attractions. According to Lennar Corporation marketing specialist Allison Landry, Lennar’s active-adult buyers are gravitating toward large spreads of hardwoods, top-shelf cooking environments, and tiled master baths with larger super showers. Overall, Lennar is increasingly building homes in Virginia that highlight center kitchen plans, top-grade cooking appliances, granite countertops, and upscale lighting. One thing contributing to the company’s success throughout Virginia is the “Everything᾿s Included” program. As Landry describes it, customers benefit from this program by enjoying the simplicity of buying a home without having to haggle or compromise on some of the most desired features because they᾿re already included for the most part. While home design has remained somewhat static in the last decade or two, Del Webb recognizes their active adult consumers are as dynamic as ever. That opportunity has challenged the company with constructing not just new home styles, but creating a whole new style of living. 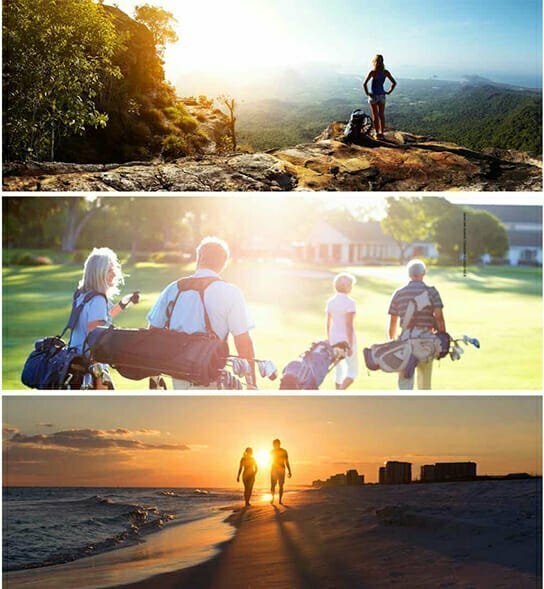 That’s what Baby Boomers receive, for example, when they buy into Del Webb Charleston, a fully amenitized resort-style development that stretches across 360 acres within the lovely Lowcountry community known as Cane Bay Plantation. 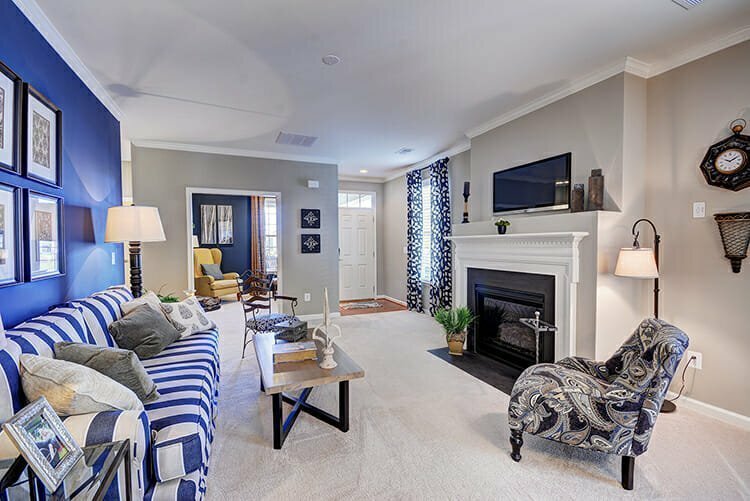 As Del Webb describes it, their homes are built with quality materials and modern must-haves like flowing, flexible living spaces and a wide range of new standard features and options. That includes things like generous kitchen islands, options for master suites with mini-master bedrooms to ensure everyone gets a good night’s sleep, and interior designs that maximize natural light. Whether it’s a production home for the ease and cost-effective nature, a semi-custom that allows you to make choices without being overwhelmed, or a custom home that only is limited by imagination and budget, you are sure to find a home that is within your means. Spring is the season of renewal. All the signs are there: the weather is getting warmer every day, plants are sprouting green foliage, and birds are building nests for the arrival of the next generation. So why not make this spring your season for a fresh start? You’ve been thinking about it all winter. The kids are grown and off to meet the challenges of their young lives. So there’s no better time to answer the question: What’s next for us? Here at ideal-LIVING, our mission is to connect folks like you with communities dedicated to the adventure that life still holds. Some are located near cities with an array of cultural activities and professional services. Others offer a small-town lifestyle with modern conveniences in more rural locales. 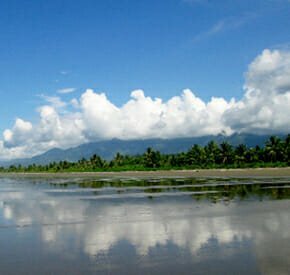 And another group features the chance to reside at a vacation destination by the seashore or high up in the mountains or even beyond the borders. What’s right for you? Well, you can’t know until you get out there and see for yourself. That’s why we’ve created this special “Ultimate Excursions” section. You can’t make a big decision about the next chapter of your life from words in print or online promotions. You need to go there and get a first-hand feel for the place. Plan a trip this spring to the places that interest you the most. And why not have some fun while you’re at it? We’ve done the homework for you to find great spring events that are happening in popular areas and residential communities. We obviously couldn’t include them all, but on the pages that follow there are festivals galore that feature the performing arts, music concerts, craft fairs, sporting events, and local cuisine. Pick one or more and plot a course to visit when those places are putting on a show for your enjoyment. Then check out our “Venture Out” section—we’ve made it a pull-out so you can take it with you. Leading communities are rolling out the red carpet just this spring to give you the chance to check out the local lifestyle and available properties. Spend a weekend being treated like royalty and sampling the amenities. Meet folks like you who’ve made the move and get straight answers to your most important questions. So get started today by planning your “Ultimate Excursion.” Make this spring vacation an adventure of discovery and you may just return home with a good idea of where you’re headed next. 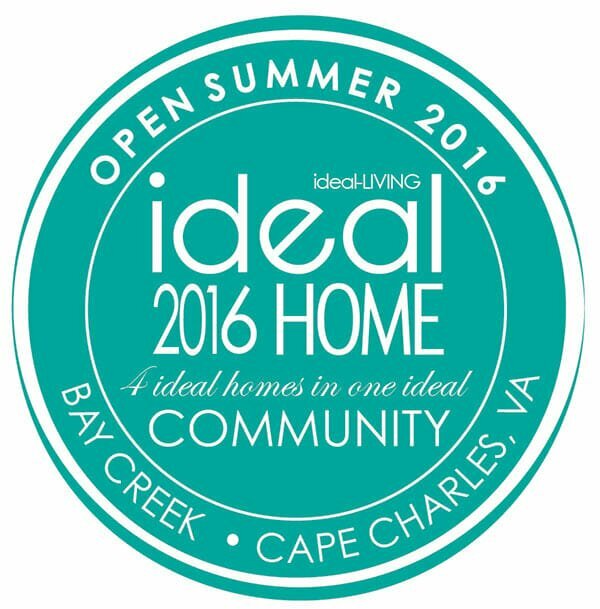 Ideal-LIVING magazine is proud to announce four magnificent homes are under construction at Bay Creek in Cape Charles, VA, as the 2016 ideal-LIVING Ideal Homes. This is the first time we have designated four homes in one community. These homes will be featured in the summer issue of ideal-LIVING. The four homes bare the names of figures who left an indelible mark on Virginia᾿s Eastern Shore. This three-story home has a delightful split personality. The street-side is cloaked in patrician formality, with round columns on the porch and a Palladium window over the front door. The waterfront side is breezy and fun, with a double-gallery porch running the entire length of the home. 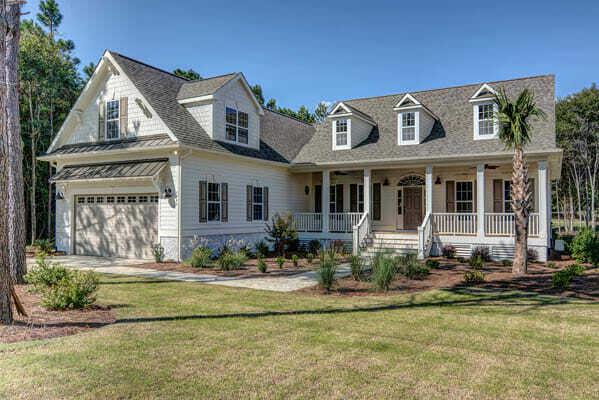 The kitchen, breakfast room and living room connect to the lower porch, while the second-floor master opens to the upper porch to take advantage of the Chesapeake Bay views and breezes. The second-floor bedrooms have their own bathrooms and generous walk-in closets. The expansive third-floor space can be finished as a bedroom, office or gameroom. Exclusively offered at $2,126,000. This three-story home is a playful interpretation of the Shingle style, an American classic that has been a coastal fixture since the late 19th century. It features shakes and board-and-batten siding, with roof overhangs, exposed rafter tails and classically proportioned lattice columns on the front portico. The rear porch extends the length of the main level and is partially enclosed with windows in the breakfast room, while the rest of the porch opens directly to the keeping room. The second-floor master connects to a private covered terrace that overlooks the Bay for quiet reflection at the end of the day. The large third-floor space can be finished as a bedroom, office, or game room. A detached garage continues the Shingle motif with a bonus room above. Exclusively offered at $1,729,000. 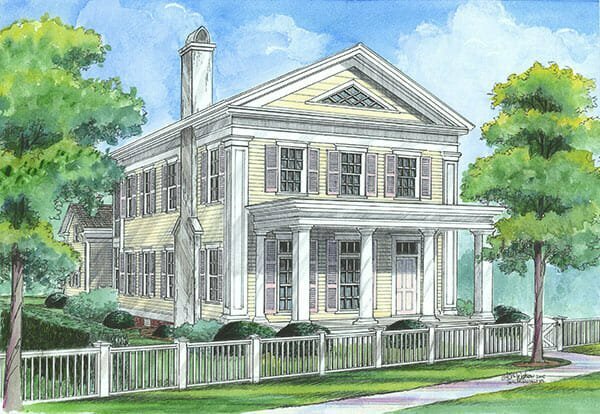 This home᾿s design is High-Style Greek Revival, with a variety of historically-authentic details. 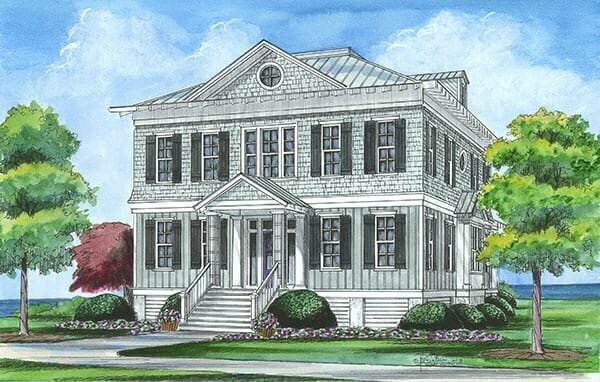 Monumental pilasters anchor the corners of the house, while the three-bay front porch features both square and round Doric columns. The enclosed double-gallery porch on the rear elevation serves a dual purpose. It breaks up the mass of the house and adds visual interest while accommodating a breakfast room on the lower level and closets on the upper level. The garage is designed to resemble a carriage house or kitchen attached to the home well after initial construction, as was the case for many of the vintage homes still standing on the Eastern Shore. Exclusively offered at $859,500. 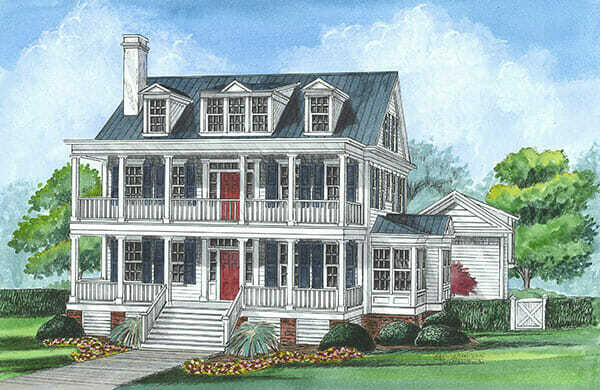 Allison Ramsey Architects of Beaufort, SC, has perfected the style and feel of the Coastal Victorian vernacular, and this delightfully-rendered Cassatt Cottage is just one more sterling example. At a little under 2,000 square feet, it might sound a bit undersized, but few homes pack as much punch. It features three bedrooms and a rooftop terrace that looks toward the beach, the Chesapeake Bay, and beyond. 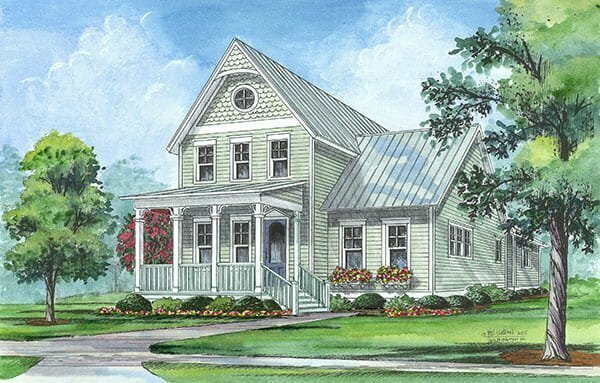 The wide and welcoming front porch, enclosed back porch, and light and airy interiors make it ideal for living the good life on the Eastern Shore. Plus, it᾿s only a short walk from Bay Creek᾿s two-mile private beach and the new Beach Club and Fitness Center. Exclusively offered at $541,000.